HAIL TO THE NEW PRODUCT TEAMS! The Corporate Innovators! The magicians who preside over the annual unveiling of the BIG annual news … the BIG reveal. The salvation of next year’s business plan. The main event at the annual Sales Meeting. Here’s a Not-So-Newsy Newsflash: you can’t wait a year for news anymore. And, let’s just say it, news built on last year’s insights. Did you know Amazon tests a new product every 11.6 seconds? For the rest of us, we just chalk that up to the fact that not all innovation can match the speed of tech innovation. But does that give us immunity from speed of news? No. Our news-worthy innovation must shift to more fertile ground than the 1-3 year pipeline of new products. The real opportunity for innovation today is in smart, responsive speed to continuous learning. It’s in the micro-movements, the underbellies, the less glorious teams that run our businesses. Is your learning an annual event? Are you testing ideas on such a large scale that any high-impact opportunity will be buried under a load of Gen Pop manure and never exhumed? Do your researchers spend months trying to schedule, socialize and agree upon how the topline will read? How much debate goes on regarding how to “position” the results so all “stakeholders” can stomach it? Newsflash: … oh wait – didn’t we just have a Newsflash? Yeah. Get with it. That’s the speed of news today. Here it is – if you’re letting your new products team drive the News Bus, you’ll probably arrive when the party’s over. Why? The NEW news is that innovation is no longer in the WHAT. It’s in the HOW. And that, my friends, falls squarely outside of the new product team’s purview. New products: step aside. Your role is changing. You know where innovation lives today? In customer service. In distribution. In reframing the context of the conversation. In re-districting the competitive set. By today’s big standards, innovation that stops at product and packaging is small. Innovating HOW we GO to market over WHAT we BRING to market is where today’s action is at. And it’s attracting more innovative thinkers and doers by the nano-second. Is it a vending machine, a restaurant, a storefront, a pop-up? Is it a consumer packaged goods company or a tech company? Is it a new research tool? What the heck is it???? Well, it’s chef-curated salads and snacks in nicely designed, BPA-free, recyclable packaging. But Farmer’s Fridge isn’t the story of a chef-curated salad in mod packaging. It’s a story of innovating the HOW …. HOW this salad is distributed. HOW this salad is merchandised. HOW this salad is discovered. HOW this salad progresses shared values. 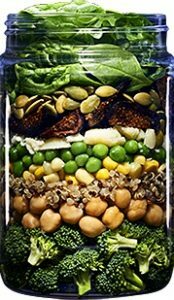 HOW this salad interacts via its app. HOW this salad learns behaviors. 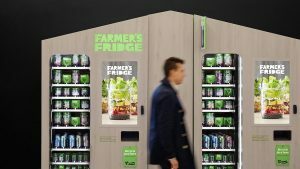 By completely reinventing and redesigning the dusty, dry, old vending machine, Farmer’s Fridge offers modern, 24/7 vending access to fresh, chef-curated meals that are restocked daily and refreshed every 24-48 hours. 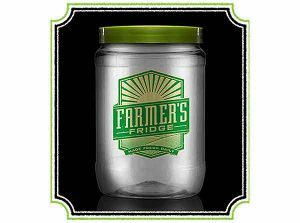 From Almond Butter Oatmeal to Salmon Nicoise Salad, Farmer’s Fridge claims back the BPA-free jars via recycling on the spot, composts all kitchen scraps, and donates all unsold items to a local pantry to fulfill a goal of Zero Waste. And that’s where we’d fail. Because another fancy salad in a BPA-free jar in the produce section of your grocery store would be a big, fat, me-too flop. Innovating the HOW over the WHAT can speed up your news cycle responsibly. Because, you have two choices when it comes to innovation: revolutionary or reckless. Reckless innovation looks like this: moving faster than humanly possible to get a product out the door … cutting corners, ignoring key insights, discarding thoughtfulness, embracing politically motivated rationale, lapooning logic … all for the end goal of hitting deadlines, shipping product, loading inventory, and making your annual number. Year two it starts all over again to make up for year one. Sound familiar? Revolutionary innovation stops, thinks, and asks a question. If the purpose of innovation is to keep our brands fresh and relevant, how can we think beyond the traditional barriers of product innovation to open our businesses to new ways of doing things that test quickly, materialize fast, blow minds, and surround us with non-stop stimulation, relevancy, and conversation starters? Innovation in HOW you go to market, HOW customers discover you, HOW you respond to their inquiries, HOW you make them feel when they experience your brand, HOW you follow up with them … these are the ever-growing pastures of innovation. And they are rich, fertile, and endless. Shake Shake isn’t about a better burger. Soul Cycle isn’t about a better bike. Look around. You’ll see it. Innovation has found a new home. 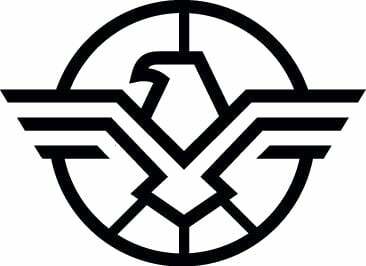 It’s happening right under our noses. And the true innovators are frolicking in it.